As seen in "MythBusters: Christmas Tree Lights." Explanation: According to the National Fire Protection Association, every year in the United States, hundreds of yuletide fires flare up from Christmas tree-related causes. MythBusters Jamie Hyneman and Adam Savage trimmed some parched pines to illuminate whether leaving those lovely tree lights on can truly set a home ablaze. Today's Christmas tree lights come standard with safety fuses in the plugs to ensure overzealous decorators don't overwhelm the electrical circuits in individual wall sockets. The MythBusters loaded up a Christmas tree with the manufacturer's recommended five strands, left it overnight and returned to find no sign of fire. To circumvent the safety precautions and up the ante, Jamie and Adam dressed an extremely dry Christmas tree in 2,500 lights — five times as many as before — by using a number of extension cords and separate wall outlets. After just 40 minutes, the ambient temperature around the tree reached 225 degrees Fahrenheit. That sizzling heat would certainly get Santa sweating, but it wasn't enough to ignite the tree. 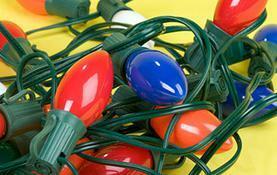 The busted myth showed that lights alone aren't a fire hazard. However, holiday revelers should still avoid overloading extension cords and electrical sockets with tree light strands in case of a short circuit. If the resulting spark lands on a Christmas tree branch, the whole thing could quickly go up in flames.